This morning we visited another project. We were met by a whole new group of very loving kids! Today I want to share with you about a different part of Compassion. This is called CSP - Child Survival Program and I'm very glad to have seen this in action today. There are only 5 projects in El Salvador that do CSP. They work with pregnant women and new moms and babies. These women are mostly single women. A lot of these moms are as young as 12 years old. Many of these girls have been raped. They have been abandoned by their families. I was so happy to see the babies and hold them. I miss Harper so much so to touch other babies made my heart full! These mothers have to be taught how to love their children and how to take care of them. They are taught how to play with them and help develop their babies. I loved this little boy - he had the most unusual blue eyes. He is 7 months old and reminded me so much of Harper with how he acted. His mom was 17. 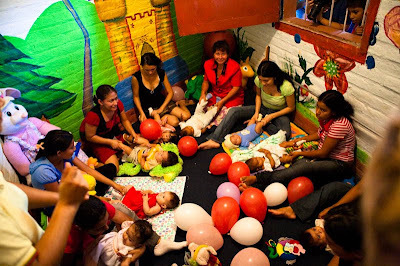 Here are the mothers working with babies aged 4-6 months. The mothers and babies are given medical check ups and groceries. 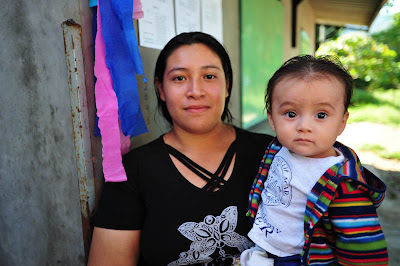 They visit their homes and make sure they are learning to care for their child. Oh I love holding a baby! 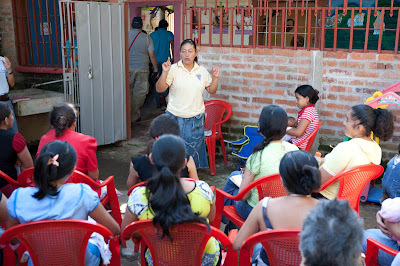 The women come and they teach them about milestones, caring for their child and about God. 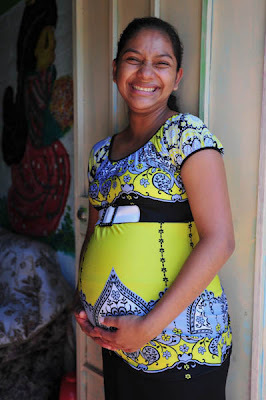 Many of the mothers have been saved after joining this program. This is run differently than the regular sponsorship program. Instead of sponsoring individuals - you sign up to donate $20 a month and it helps these programs function. 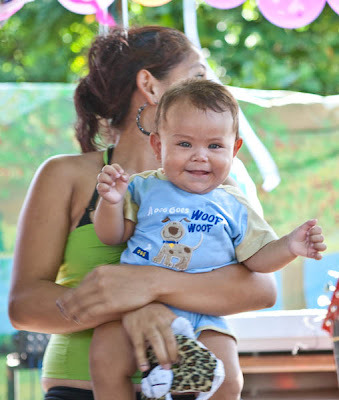 Early intervention helps these babies more than you can imagine. 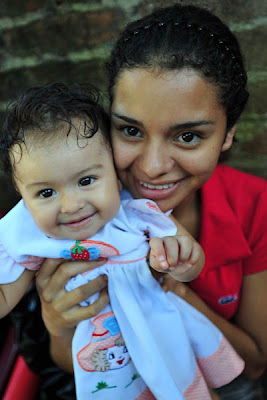 It supports these young moms who live in poverty in amazing ways. You can read more about how to help on the brand new website dedicated to CSP - check it out HERE! If you can't afford $38 a month - maybe you could help in this way. We visited a home of a mom that has 15 children. 12 of the children still live at home. They live in a one room home. There is no electricity or running water. This is the 14 year old daughter - she takes care of the youngest boy. He is the one who is in the CSP program and will become a sponsored child. These boys were BEAUTIFUL. 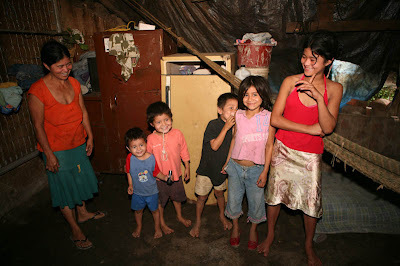 Look at the smiles on their faces - I don't think they have any idea how horrible their living conditions are. 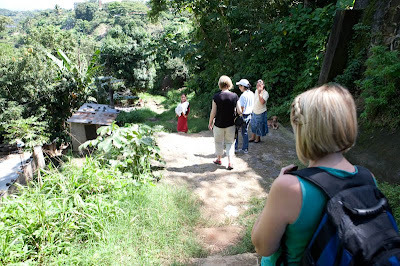 This family must walk up a huge, steep path several times a day to put water in dirty, unsanitary buckets to have water. Neither the mother nor any of these children have ever been to school. Because of where they live - they live a very isolated life. They have no friends. They sit in a dark house all day. No TV, no internet, nothing. Can you imagine? I think most of us Americans could not FATHOM living this way. It's literally like they live in a very small cave. But they had such pride and joy on their faces. Their smiles were so huge. It just shows me that material things mean nothing. Our joy can only come from God. 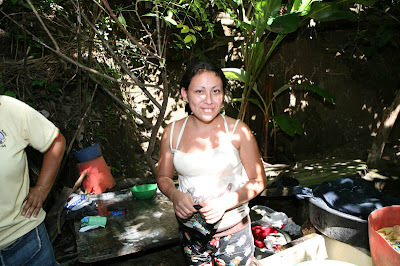 And I have found that the poorest people of El Salvador are SO close to God - probably because He is ALL they have. I was wondering if I could just put one of them in my suitcase - she has 15 children - would she miss one little boy? Just kidding. She shared that CSP has made such a huge difference. They help her feed her children and have taught her to be a better mom. She said she is applying what she is learning to all of her children. Patricia and I tried to challenge Ingrid to be proud of herself and to wait for a husband who would care for her. She was SUCH a beautiful girl. 10 people lived in this house. They did have a well to get water. We learned later this afternoon that the father of this home is the Head of the Gangs in this area. And his son is 2nd in command. A little scary. You can't imagine how gangs are just running this country. The violence is unspeakable. And she let me make one! 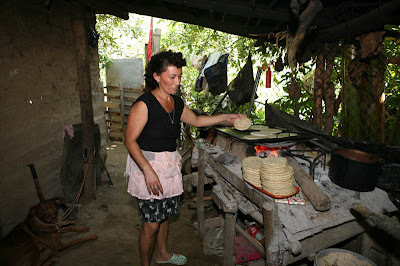 I hope Scott doesn't expect me to start making tortillas at home. ha! 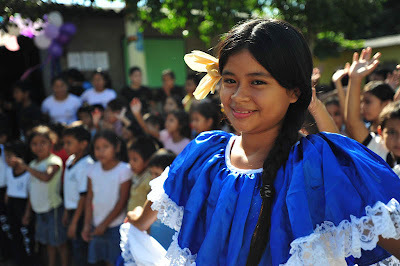 I'd love for you to consider sponsoring a child or CSP but if you can't - please just pray for the people of El Salvador. They would love that more than anything. And if you already are a sponsor - please write your child. You can't imagine how much your letters mean to these children. All I have heard constantly is how much these children LOVE their sponsors. Thank you for letting me know if you have signed up! Please continue to do so! Didn't you just LOVE that video of Harper and the donkey! At first, I thought she looked like she was thinking, "What in the world is this thing?!?" However, then she started to think it was pretty okay! I loved how she clapped when she saw the donkey's ears clap! Too cute! Many BLESSINGS to you, Scott, and the whole team! You are ALL doing such amazing things, ALL in the name of our Lord and Savior! Wow. What an amazing day. Thank you for sharing about CSP. I am definately considering it. I need to talk it over with my boyfriend but I am hoping it is something we can start to do in the coming year. I hope the rest of your trip goes well and your flight is safe! Twice in one day! I just signed up to give monthly to CSP! Such an amazing opportunity God has given you to bless the people of El Salvador. Thank you for sharing your journey with us. I hope it inspires many more to openly love and care for the poor in our world. So amazing to see what all the good this program is doing! And I'm praying for yalls safety out there! Sounds scary! Kelly, Thank you so much for sharing your journey with us. It is so easy to forget how less fortunate so many are and how much they need our help. WOW!!!!!!!! I just can't wait to talk to you! We are praying for ya'll! What an awesome experience. Thanks so much for sharing. I am praying for you and the team. God Bless! I'm really enjoying reading about all these experiences. I've had you on my heart and mind. I'm praying for you and all these sweet people you're sharing with us. I was just on the Flickr site looking at all the photos of y'all down there. Such amazing pictures. It's eveident that those kids are no different than our kids, despite the vast differences in material comfort. The SpongeBob poster and princess T-shirts made me smile - I guess some things truly are universal! Love that you were able to love on some babies today and I am so excited to hear about the new sponsorship opportunities with CSP! Watching you guys live right now! This is amazing, I wish I was there with you guys! Praying for you all! Thanks for sending these updates. As soon as I read your first post this week, I immediately wrote a letter to the little boy that my husband and I sponsor through Compassion. Reading your posts makes me wonder so much about him and serves as a great reminder to pray for him and his family all the time. It also reminded me that TOMORROW is his birthday. :) Happy Birthday, sweet Ivan! May God continue to protect you as you share love in His name. we as Americans are so blessed! Praying for you and Scott, Kelly! Praying for safety, for the right words, for the Spirit, and for all these precious kids and their families. Thank you for going. How I wish I could be there. So thankful that you are there...and being Jesus with Skin for those people! Just in case...I sponsor a little girl in El Salvador through Compassion. I know it's a far cry, but not beyond God, that you may come in contact with her someway. If by chance you, do...please, give her a hug from me! her name is Elsa Cajul and she participates in the Nueva Vida Student Center. Blessings and prayers for you and your team! So amazing! We truly do take for granted what we've been blessed with! Wow...this is just amazing. What beautiful kiddos! For soooooo many years I've wanted to sponsor a child--actually, make that a whole village of children--but haven't been able to YET;but I defiantly pray for them! Prayer can reach ALL children where as all the money I could give never would! This is amazing. I would love to go on a trip like this. You are really serving the Lord. It is so sad to see what they go through and how we take so many little things for granted. You are awesome for doing this.. leaving your baby girl to go teach/preach/listen/inspire these other women, men and children. I am loving reading about your experience and seeing all of the pictures..really opens my eyes. Thank you. I pray that you continue to have a safe journey there! 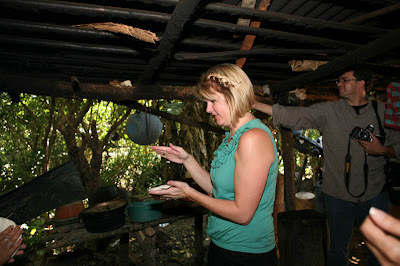 Hi Kelly, it's so amazing that you and your husband took the time to go to Ele Salvador, it's great to hear your stories and to see your perspective of how life is in these cointries. I am from mexico and have been here for 9 years now and have been now on several missions trips back to mexico and always hear alot of what you are sharing... how these kids and people just seem so happy in the middle of this poverty, but you are right, this is all they know and material things mean very little for them, we learn to live with what we have day by day, so after all we shouldn't feel so sorry for them i think they are actually happier than us that live with so much confortably and have so much more..... and i believe that once they know Jesus as they saviour they do have pure joy!!! HI Kelly, More tears today. Will you have to buy more luggage to bring home all the kids?? Bring me one. Is there anything that can be done besides send money? For those of us who don't have any, can we send a toy or some clothes? Take care of yourselves. Scott is doing great with the photography. Loved the livestream chat tonight, Kelly! So awesome! Kelly! I so enjoyed the live chat! You guys are doing great things there. Being a young mom, this hits close to home for my heart! I had an AMAZING support team when I had Dylan, and could not have become so successful with out that! So I know how important this is for those moms. We are planning on letting Dylan pick a child for us to sponsor, and I think I am going to have to do this too! Thank you for sharing! 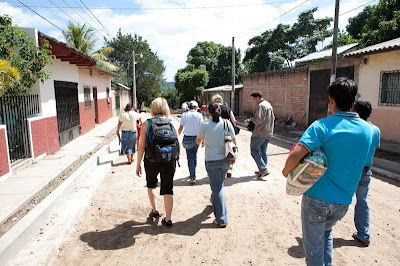 Hi Kelly, Just saw on the news that there will be a Walk for Walls here in Macon, Ga. on Saturday to send a group of kids to El Salvador to help build houses! Hopefully it will be in the area where you are. You sponsor a walker by donating so much per mile that they walk. Even if teen agers are helping to build the houses, it would have to be better than the ones you were in today. Thank you so much for sharing this, Kelly. You are an AMAZING person. Thank you for sharing your trip. I have been thinking about sponsoring a child since Angie Smith went on her trip. Your blog posts gave me just what I needed to turn my thoughts into action. I just signed up to sponsor a 3 year old boy named Azael Alexander Padilla! Thanks for the many posts about your trip. Its very convicting to see how these people live in poverty, and yet experience so much joy...joy that only our Saviour can provide. 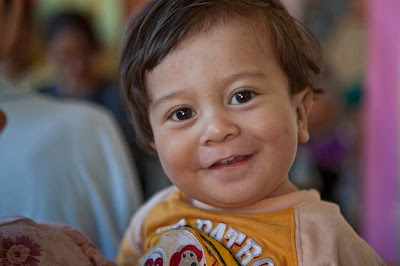 We can wait to get it touch with little Luis Zambrano, who we just signed up to sponsor. Hope to be a blessing to him and his family. Oh my goodness! I am speechless. I can't stop the tears from coming (and seeing the Harper video on your mom's blog definitely did not help! )I have always had a passion for children. When I was little, I would send money from my own allowance to sponsor a child through Children International. She moved on, and I went to college and never signed up again. I have signed up now to sponsor two children and send money for the CSP each month. Thank you for opening our eyes and hearts to these children and their families. My heart breaks for you, because I know you have to be missing Harper SO much, but I admire you for sacrificing a week of 'mommy time' to be a light to others. I am so glad that you are sharing this experiance with all of us. It really does open your eyes when you read this. You really realize how fortunate you are and how you take such little things for granted!!! What a great program CSP is, I am definitley going to go check out the website! I am praying for you, and I hope you continue to be safe on this awesome trip! You are doing a wonderful job documenting your journey. After I read your post yesterday, I immediately wrote my Compassion kid. Thanks for helping me remember these are real people with real stories. Now, if you could just manage to bring one of those beautiful children back to AR, I'll swing by your part of the state to pick him up :). 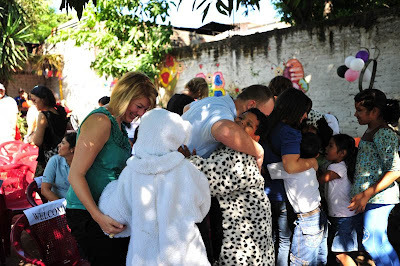 Kelly, oh my heart is just crying out for those sweet, precious little children, and all the people of El Salvador. I am praying for them! Oh I love seeing all of the pictures and all your updates. You and Scott and team are doing this for the Lord! How awesome!! I am praying for ya'll! Love ya'll! 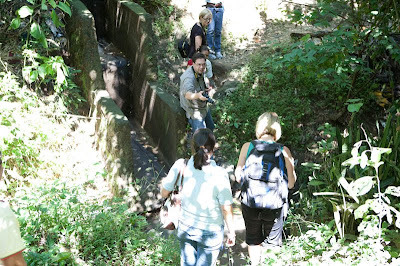 Kelly, I am loving reading about your visit, and I am praying hard for you all over there! Thanks, Kelly, for giving us these updates. I feel like I'm in El Salvador with you! Thanks for your post and information on CSP! I am talking this over with my husband and we are thinking about sponsoring a child or the CSP program! I will let you know once we decide which one! I am absolutely heartbroken for these people and others around the world who are living this way. I cried as I read this post. After the holidays I would love to sponsor a girl. I have two sons 16 and 11. I lost a baby girl several years back. I wanted to try for a girl but the Dr. said another pregnancy would not be idea for me. So maybe this could be my way of having a little girl. Thanks for sharing this experience with us Kelly. Wow, Kelly, you really are amazing! Thank you so much for sharing this. It's so easy to complain when traffic annoying on our way to work, we have a bad hair day, etc. 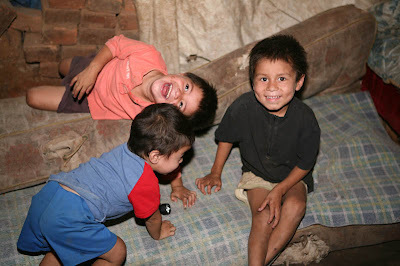 but these people live in true hardships yet they continue to smile so much! You're such an inspiration Kelly to do good things! This is so sweet...looks like you guys are enjoying your time and really making an impact on you and them! Need a new blog design? I would love to work with all of you! Thank you for bringing all these wonderful stories to us. CSP is something that I am interested in. I will be in prayer about it. I signed up last night, but I chose a girl who lives in an orphange in India. Ever since I saw Slumdog Millionaire, the children of India have been on my heart. Her name is Stella, she's 12 years old and has been waiting over 6 months for a sponsor. Thank you so much for introducing me to CSP. I know that it's something I'll want to do in the future when I'm able. This is such an amazing trip. And girl, you're rocking that braid in your hair! 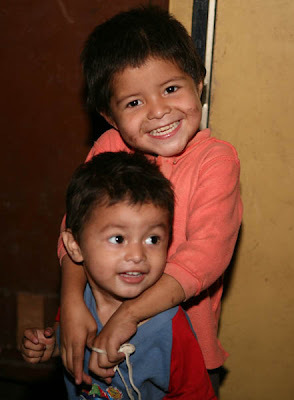 You look great and so filled with joy at helping these children and their families! I love the idea of CSP. This may just be our New Year's resolution. I just LOVE that they are doing the CSP program! Thanks for writing about it!!! We "have" a little girl in India, but we may have to add the CSP program, too. I am a play therapist and I have just started working with parents of kids as young as infants. It's SO important to teach them. I love that it's being done in other countries!!!!!!!! What an awesome story!! I went to Haiti in April to work at an orphanage for a week. We noticed that the kids there are really happy too!! Have a safe trip home! My husband and I sponsored a girl from Bolivia named Neza through Compassion a couple of years ago and still continue to. Her letters brighten our day too- they are so inspiring. She is full of life and so grateful to our Lord and even for what little they do have. It is amazing to see how differently we live around the world- humbling really. Thanks for sharing your journey. I loved seeing these pictures--we support CSP and know what they do, but it is just so wonderful to see it--thanks for sharing the pics. I really would like to know that my little child actually receives my letters. I have sent him photos and have never had any response. I never heard from him about gifts I have sent. His letters are very generic. How do I know he actually received the gifts and photos. What a wonderful post and an inspiring trip! 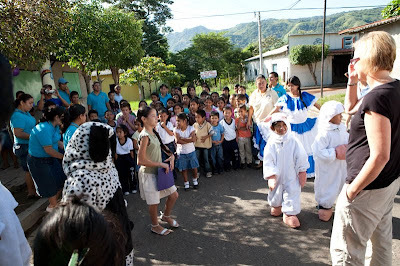 When we lived in Honduras we worked with a group of nuns that lived two hours from the nearest grocery store! They were doing work very similiar to that of Compassion. Until you visit these countries and see these agencies in action you have no diea how lucky we are in our country. We take so much for granted and often forget how blessed we are. Thank you for spreading the word of Compassion and for reminding us all what a wonderful lives we lead! We just signed up for CSP- looks like a great organization and I specifically love what CSP does. Thanks for bringing Compassion to my attention! We just signed up to sponsor a 5 year old little girl from El Salvador. We can't wait to get our informational packet. She is just precious. Thank you so very much for putting a face to this program. You daily posts are beautiful and heartwarming along with heartbreaking. Thank you for putting a face to this program and spreading the word of what an amazing program it is. Oh how you are soo right when you said that they have joy even in the most proverty stricken places. The only thing they have is GOD. They probably know HIMmore than I could even imagine living in my warm, cozy home & in my luxury lifestyle (which by the way isn't all that luxurous). I pray that Scott & You are safe & serve the LORD during this trip. 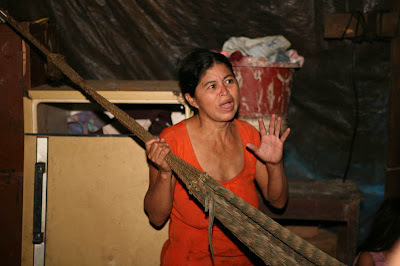 I pray that the people of El Salvador (esp THESE people) are taking care of by HIS holy hands. & I pray that you & Scott have a safe return home back to Harper. I have enjoyed reading about your trip and how you and your husband have impacted the lives of these children. I have a question however and wonder why Compassion would be sponsoring children who are in the home of a known gang leader? I had posted on your previous post that I wanted to sponsor a child but after reading this I am going to donate monthly to the CSP program. That is a cause that is very dear to my heart. I had my son when I was 15 and was so blessed to have so much family, church and community support. Here is the states there are programs that help teen moms in so many ways and I am so thankful I had so many awesome mentors to help me through my sons first years of life. What a great thing they are doing. Praying for all of these families. Thanks so much for sharing. Early intervention is very dear to my heart. I am a social worker at an early intervention program here in Arkansas. We are working to do many of the same things. I am a true believer in early intervention and have seen its success first hand. I will be praying for these families in El Salvador!